Didn’t you JUST have a birthday last year? We just wrapped up birthday season around here. Well, mine isn’t until May, and the Man’s is in September, but The Kids’ birthdays are the ones that really matter, and they just turned 7 and 9. Wow. I love celebrating birthdays. There’s only one day out of 365 that’s just yours. Maybe not JUST. The Girl shares her birthday with our cousin Ben, our friend Harriett, Dr. Seuss, and our friend/babysitter, Josie. I share mine with my best friend Liz, another friend Debbie, a friend’s ex-husband, and two other girls with whom I graduated high school. I’m not sure why that’s so fascinating. There are, after all, 365 days in the year. There are billions of people who need birthdays. The Man and I got married ten days before my 25th birthday. To give him credit, the days leading up to that birthday were rather chaotic. We had a rehearsal dinner, dozens of family members and even more friends in town, a wedding, and a fantastic honeymoon in Hawaii. All of those trump a birthday. However. He forgot my birthday. I was working at Fat Man’s at the time. Everyone there knew it was my birthday. I got my free lunch at The Pit, and everyone passed along their well wishes. The Man and I talked on the phone a couple of times, but he never mentioned my birthday. I wasn’t mad (no really, I wasn’t), but I decided to see just how long this could go. When would he realize it? Once we were both home from work, I smiled to myself. This was funny. We sat there together, and I had a secret. I’d share it soon enough. There was a knock at the door. It was my mother-in-law. She came bearing gifts. And a cake. When the door opened, The Man said, “Oh crap (or something like it).” I laughed, because again, I wasn’t mad at all. My birthday is now on his big calendar and work. His bookkeeper also keeps it on her calendar. When The Kids have birthdays, it’s not about spending as much money as we can. I try to make the day special. Their chair at the kitchen table is covered with balloons. Happy birthday banners hang throughout the house. Candle laden donuts are for breakfast, and we have lunch together at school. It’s their choice for dinner, and they usually choose Mexican. The Boy won’t wear the sombrero, and The Girl doesn’t like clanging pots, but they do get the free fried ice cream at Vallartas. Come to think of it, I’m not sure what happened to their birthday tequila shots. As much as I love celebrating birthdays, I hate planning kid birthday parties. I should like them. I pay attention to detail, and I like making things. I’m a planner by nature. Kid birthday parties are beasts. I’ve expressed my distaste for the extravagance they’ve become because of Pinterest and other internet competitions. I thought that was my problem. I blamed facebook and other bragging sites and my inability to keep up. I think the pressure might be self imposed. I’m not worried about my kids having fun at their parties. I truly don’t care if Johnny Smartypants had homemade party favors. I don’t want your kids to think my kids are lame. You see, I know my kids aren’t lame. As far as I’m concerned, they’re pretty cool. I don’t want to screw that up. If the party is dumb, will your kids think my kids are just as dumb? It silly, really. It’s just a birthday party. There’s just so much pressure. I will not cave. The parties feel so daunting each year. I don’t want to forget anyone. If I intentionally leave someone out, it may be for numbers’ sake only. Then there are invitations, the cake, and party favors. I’m not all that worried about how expensive any of those are, but each element must be present. I stress. Fortunately, each kid had a simple and sweet party. The Boy wanted to go bowling with friends, but didn’t want the birthday fanfare. We invited 8 kids and bowled for two hours. Honestly, they’re so terrible at bowling (yes, even with the bumpers); they only got to bowl two games. I think they all had fun. We sent home cupcakes in brightly colored boxes instead of serving cake. 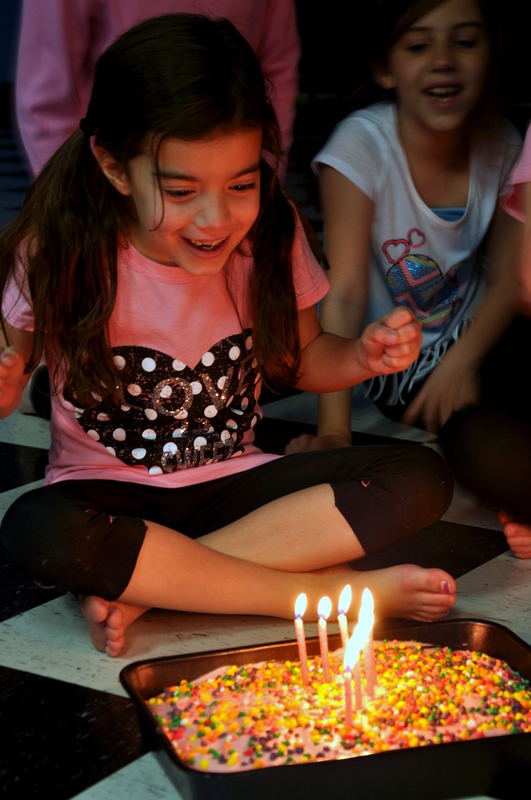 The Girl had her party at the studio where she takes dance. The allure was obvious. We provide the cake and the kids, and the studio does everything else. That’s my kind of party. Pulse Dance Center put on one of the more fun kid parties I’ve been to, complete with a jazz routine to a Bieber song. The favors were cds made up of cheesy top 40 hits. Simple and inexpensive. I did worry that cds wouldn’t be cool anymore. Oh well. I can’t afford iPods for all. At the end of the day, they each turned another year older. As stupid as it sounds, I can’t believe it. I was warned. They‘re growing too fast. For now, I happily stress about planning their parties. I also look forward to a nice Cabernet as reward for all of my hard work.